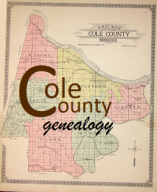 Cole County, like most counties and states throughout the country, has numerous cemeteries. These range from large church affiliated cemeteries to small family plots on local farms. Some of these cemeteries have caretakers and others, sadly, do not. Below is a listing of all known cemeteries in each township. Please contact us if you know of others. Click on a cemetery name to be taken to a separate page with a map, photos, and an index of all known interments.